Reagan didn't make it three in a row. She was up last night from 3-4:30am (but at least I was able to get her to drink a bottle while she was up). It's a never ending battle trying to get more food in her. This whole virus thing has really thrown her off and now she's back in the habit of eating less...that has got to change. Waking up in the middle of the night threw off her whole day today. She woke up late and ended up not taking a nap until after noon and then slept through occupational therapy...I didn't even bother taking her, I just let her sleep. She was actually still asleep when her vision therapist showed up at the house at 3:15...that's when I finally woke her up. She didn't seem to mind too much although she was still a little groggy. And that was it for naps. One nap is NOT enough for her. Around 8pm she got over tired and super fussy then she started having tummy pains...let me tell you that is not a good combination! She cried and cried for the next hour and a half...then three diaper changes later she finally fell asleep. What a night. Please God let her sleep through the night tonight. Last night was another awesome night for Reagan! She slept (in her crib) all night without so much as a peep! This is definitely an answer to prayers!! We are just so thankful that it has been such a smooth transition...I mean we are talking 19months of sleeping in a swing! This is pretty amazing. She has been in a great mood today as well. She had PT and was doing really well with her head and trunk control. Her therapist was just giving her a little support and she was sitting up big and tall! Very impressive. She has been pretty sleepy today. She took a 2 hr nap before therapy and then took another 3hr nap afterwards...although she did work pretty hard so I don't blame her for being tired. I've been noticing lately (and especially today) when she takes a nap her little cheeks become very flushed. I think it may be a side effect of the topomax. It can inhibit their ability to sweat (so you really have to keep an eye on them in the hot summer months). It's weird because it's not like rest of her body is hot...but her little cheeks turn bright red and are very warm to the touch! It does make a pretty picture though...pink rosy cheeks...so sweet! Seizures have been less lately (since starting the topomax) but today for some reason they seem to have increased. We don't want to see any increases...just a steady decrease until they are gone for good!!! Please keep this in your prayers! Last night was better than the night before, but still exhausting. Reagan woke up and then wouldn't go back to sleep. I hate that we're back to talking about sleepless nights again. I'm hoping it's only for the time being and that this too shall pass. Reagan does have a lot on her plate right now, hopefully she'll get the hang of it soon and start sleeping through the night again. Our sanity depends on it. Her physical therapist came by our house today to check out her casts...how wonderful is she? Reagan's curling her toes over the edge of the cast and it's causing some irritation. I put some cotton under her toes and that seems to help. Her therapist thinks it's OK, but wants me to check with the orthopedic tomorrow to see what they think about it and make sure they don't need to recast her because of it. 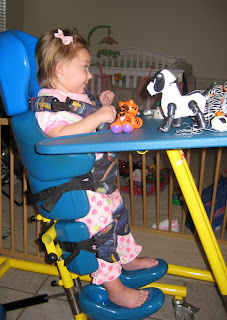 She also helped us to adjust Reagan's stander to fit her better. No more excuses...she needs to be in it daily. There's really not enough time in the day for everything we need to do. From medicines to bottles to baby food to doctors appts and therapies at home and away...there's just not enough time for it all. Tomorrow morning we have her ENT appt (the one we had to cancel last week because of our trip to the ER). I'm curious to see what he has to say about the results of her hearing test. She's been super smiley tonight. Wide awake though...not sure when exactly she's going to be ready for bed. It seems she's oblivious to the time change. 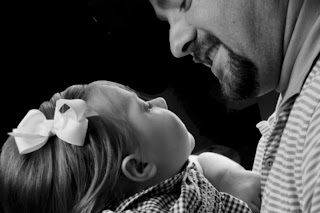 Below is a picture from her photo shoot a week ago (the one that she was either crying or fussing the entire time). She looks like a little angel...of course she was asleep...but that's when she's her sweetest. Last night was absolutely horrendous! Reagan was up and down all night long. She went to bed early at 9pm (but we didn't get to bed til past 11) and then she woke up at 1:45am. It was every hour or so after that (with a big throw up in the middle). It's hard to say what's going on with her...there are just too many variables. She's still getting over this sickness, she's sleeping in her bed for the first time ever, she's got 2 big giant casts on her legs and she's teething (a new big giant molar is coming in right above the other one on the left side...not to mention several other teeth that look like they could break through at any moment). So we've all been a little fussy today. It's actually Mike's birthday today, so hopefully Reagan will give him the gift of sleep tonight. My birthday is coming up as well...can you guess what I want?? No seizures. Please keep her in your prayers!! She actually just fell asleep so I better wrap this up and get to bed!! Good night (hopefully). 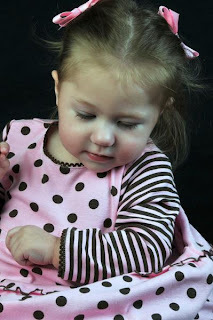 One of Reagan's little friends Zoey has just been diagnosed with acute myeloid leukemia (AML). As you can imagine it has been a devastating blow to this family. This little girl has already dealt with so much in her short life...it seems so unfair that she's bombarded with yet another gigantic obstacle. She's actually quite the miracle child...she's already overcome a stroke, a severe heart defect, and infantile spasms...I have no doubt that she's going to beat this as well. I just ask that you would please keep her and her entire family in your prayers as they embark on this new journey. I've added a special picture link to her site at the bottom of our blog...please visit her site and offer her family some prayers and words of encouragement! !